Bite Me: Bite Me creates food experiences in catering, workshops and StreetDinners. 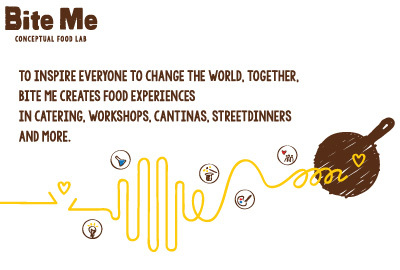 To inspire everyone to change the world, together, Bite Me creates food experiences in catering, workshops and StreetDinners. Our world is not without it’s problems. Malnutrition is widespread, our ways of living are depleting the world’s resources, and our societies are growing further and further apart. At Bite Me we believe this has to change and we believe the change starts with Good Food, which is food good for ourselves, our communities and our planet. To inspire everyone to change we create food-based solutions. In our catering and workshops where food is the inspiration, in our cantinas that bring together communities around good food, in our StreetDinners where food connects neighbor(hood)s and so on. Each of our concepts are for different parts of the food system, from farmers over companies to neighbours. Initiatiefnemer: The Bite Me Crew is a collective of partners from all different parts of the world and with a variety of academic and practical backgrounds.